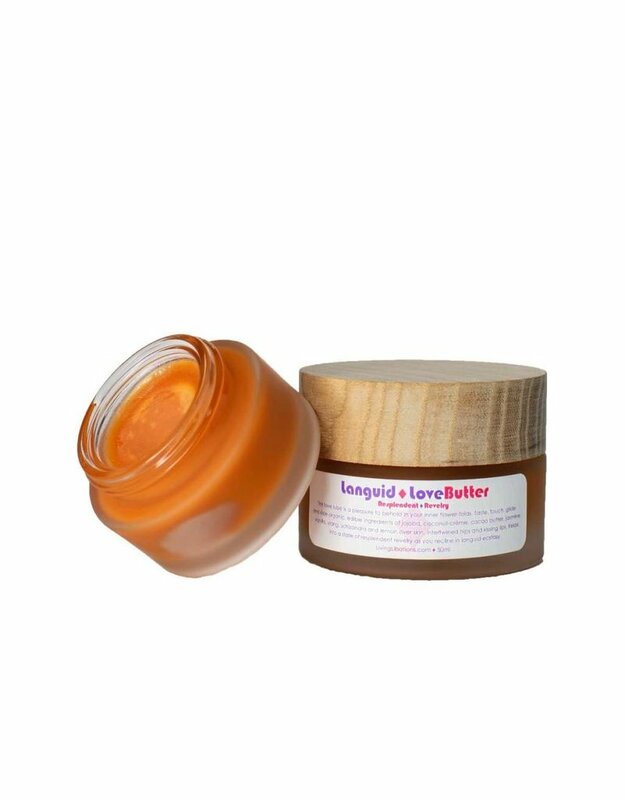 Languid Love Butter is created with a carefully-crafted brew of beneficial botanicals. Taste, touch, glide, and slide this loving essences over intertwined hips and kissing lips. Relax in revelry, lounge in languid ecstasy, and consecrate desire’s divinity as you rollick in the release of Kulamrita nectars. Directions:May be used as a moisturizing massage crème, non-latex lubricant, or as a love-lube to prepare lovers’ skin for the closest kind of encounter. For use every day or for long languid times of play. Patch test inside the elbow before applying to more sensitive skin. Organic Ingredients:Theobroma cacao (Cacao). Cocos nucifera (Coconut Crème), Simmondsia chinensis (Jojoba), Cananga odorata (Ylang), Jasminum grandiflorum (Jasmine), Vanilla planifolia (Vanilla), Myristica fragrans (Nutmeg), Citrus limon (Lemon), Schisandra chinensis (Schizandra), and Zingiber officinale (Ginger).